Back in the day, vertical guidance on final approach was reserved for the Cadillac approaches, which almost always meant an ILS. Airports whose tax base or FAA grant status didn’t cut it were stuck with non-precision approaches. Without vertical guidance, we’d cross a fix and step down to the next altitude, fix after fix, until stepping down to the minimum descent altitude (MDA), where we’d level off and peer hopefully into the murk looking for an airport. If we got lucky, we saw it before it was directly below us, and too close to descend further and land. GPS changed all that. RNAV (GPS) approaches often have an option for “Localizer precision with vertical guidance,” or LPV. 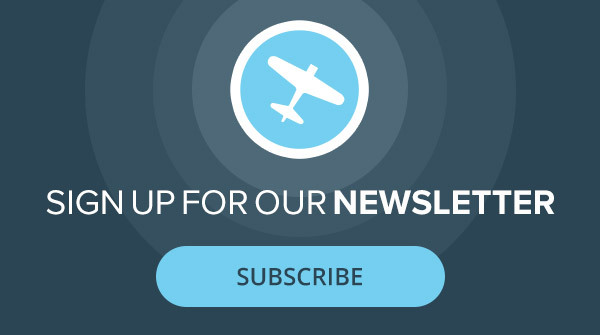 This offers ILS-like guidance and minimums using only GPS. It requires the more accurate WAAS GPS, but those have been the norm for over a decade. Don’t let the warm embrace of vertical guidance be your siren song into an NTSB report, though. There are traps for the unwary. One VFR day, we were approaching Sidney, New York (N23), following the LNAV+V guidance for Runway 07, but all we could see ahead and below were the green, rolling hills of central New York state. It became clear that said suggested vertical guidance was suggesting a route right through one of those rolling hills. We leveled off, passed over the hill, and there was the airport on the other side, too close to land without circling back around. Suggested vertical guidance is simply a path from the final approach fix to the runway. That path starts at a safe altitude above MDA but continues down past MDA to the runway. Avoiding objects below MDA is entirely on the pilot. We were visual. We saw the hill. No big deal. The potential trap is that because vertical guidance is what we get down to 200 feet AGL on a precision approach, our mental image of vertical guidance is of a clear path from intercept to touchdown. That’s simply not true with +V. Just because there’s a suggested vertical path doesn’t mean it’s possible to fly it all the way to a runway. For the Runway 07 approach, it’s not possible. A more common (and less hazardous) trap can be following a glidepath outside the final approach fix (FAF). Both the ILS glideslope and the GPS glidepath are available well outside the final approach fix. If you’re high enough, you might be in position to simply follow that path down through the final approach fix and all the way to decision altitude. I say “might” because you must remain above any stepdown altitudes outside the FAF no matter what the needles say. Following the glideslope should do this so long as your current altimeter setting matches the actual sea-level air pressure for your location. However, if the ATC-assigned altimeter is significantly lower than the real-world pressure, as can happen during improving weather conditions, your altimeter will read low. Your indicated altitude could be lower than you’re allowed to be on that segment of the approach—even though your aircraft is physically at the correct altitude. That’s an altitude violation because controllers ensure separation assuming we’re all flying by indicated altitude. This is a recurring problem for airline crews flying the ILS Rwy 25L and ILS Rwy 24R approaches into Los Angeles (KLAX), which contain a veritable staircase of stepdowns. Controllers vector other aircraft under the arrivals to KLAX. Airliners descending on the glideslope without watching those crossing altitudes can get too close to aircraft below them. You could, too, in a similar situation, and get that dreaded phone number to call after landing. Another trap lurks when there’s a stepdown between the final approach fix and the runway. These aren’t common, but they exist, and your GPS might not show it. The RNAV (GPS) Rwy 36 approach into my home ’drome of Portland, Maine (KPWM), has one. You cross the FAF at ZIRSO 5.3 miles from the runway and at or above 1,800 feet. The MDA for straight-in to Runway 36 is either 460 or 560 feet, depending on your avionics. However, you can’t go down to MDA until you get past an extra fix, called BEYDA, 1.9 nm from the runway. This is where a habit of crossing the FAF and immediately descending to MDA can bite you. If you fly this approach with an older GPS, such as an Apollo GX60 or KLN 94, BEYDA won’t appear in the GPS flight plan, either. In fact, no stepdown fixes inside the FAF exist in these older GPS databases, because there isn’t enough memory in these old units for the ever-growing number of GPS fixes. Guess which fixes get omitted. 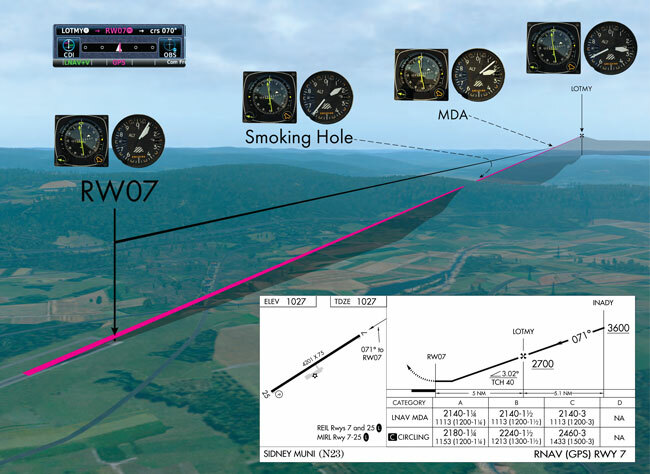 It’s on you to read the chart and identify them by distance to the runway. As an aside, older (non-WAAS) Garmin GNS navigators have limited memory as well. Their databases omit some of the fixes in the enroute structure. Same airport, different approach: The ILS or LOC Rwy 11 at Portland. If you fly this localizer-only, you need the final approach fix at MAINA, a stepdown fix inside that at FINUS, and the missed approach point of RW11. Recently, I loaded the ILS Rwy 11 approach into a Garmin GTN 650 GPS navigator, and FINUS wasn’t in the flight plan. No big deal; it’s 1.8 nm from FINUS to the fix RW11. We could cross MAINA, descend part-way, and watch the distance to RW11 count down, just like flying RNAV (GPS) Rwy 36 approach with the old GPS. A subsequent day, I went to load that same Runway 11 approach into a different GTN 650 in a different aircraft, and there were two possible approaches to load: The ILS Rwy 11 and the LOC Rwy 11. It turns out this GTN had a North America database from Garmin instead of Jeppesen and had a separate entry for the LOC Rwy 11. The difference was that the LOC version contained FINUS. All this is to say: Use your vertical guidance, but don’t assume it’ll keep you out of trouble. Match each step of the approach as charted to the piece, or pieces, of information you need to fly that part of the procedure. Do it as early as practical to catch the traps that snag the unwary. Then enjoy the smooth, stabilized, Cadillac descent of two crossed needles guiding you to the runway. The acronym on approach charts is VGSI, which means Visual GlideSlope Indicator. This could be a Visual Approach Slope Indicator (VASI), which usually looks like two sets of lights that appear red or white, or a Precision Approach Path Indicator (PAPI), which looks like four lights in a row that form different combinations of red and white. The VGSI is an essential component of instrument approaches in low visibility, but it’s also used by VFR pilots to ensure a safe path to the runway, especially at night. The trap is that too many pilots believe they’re safe when they have exactly zero protection. It’s possible to see a VGSI 10 miles from the airport and start following it down only to fly right through some powerlines on a hill 6 miles from the airport. That’s because, unless otherwise published, a VASI only guarantees clearance 4 nautical miles from the threshold of the runway it serves, and 10 degrees left or right of the approach course. Outside of that wedge, there could be something inches below the path you see between you and the lights—or even something skinny between you and those lights that comes into focus about five seconds before you hit it. PAPIs only guarantee 4 statute miles, which is 3.4 nautical miles. With a VASI or PAPI, the distance is from the runway threshold. If you’re GPS direct to the airport, the distance you read is to the geographical center of the airport, maybe half a mile or more beyond any runway threshold as you approach. Personally, I’d ignore that fact just to have a bit more buffer and assume the safe zone starts when the GPS reads 4 miles, 3.4 miles, respectively. Baffled is what you might be if you turn final for Runway 01, drift a bit right of centerline, and the VASI vanishes. It’s blocked so no one tries to use it from that side. 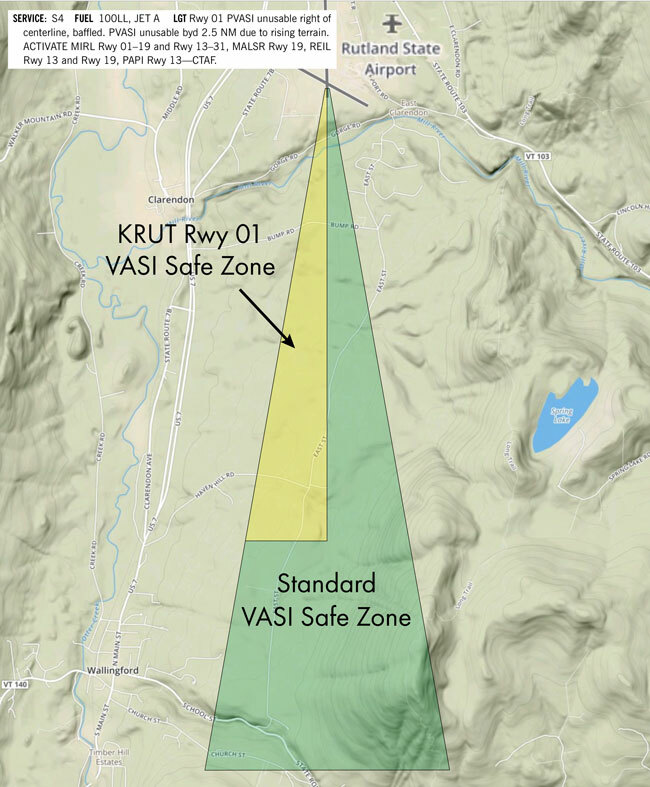 It’s also essential to know KRUT’s VGSI for Runway 01 is only good 2.5 nm out because there’s a small mountain just south of the airport. Given the temptation and limitations of VGSIs, I like having a terrain warning or profile view on some piece of avionics, usually the iPad. But whether you do that or not, remember the VGSI is just as unforgiving of ignorance as...well, pretty much everything in aviation. I’m a newbie to aviation (never been on anything but an airline jet-yet). Is there a key available somewhere for all of these acronyms? It would certainly help me to get more out of the articles, as well as speed up the learning process! Case 1 is hardly LNAV/VNAV or LPV’s fault is it? Desending below MDA with out the runway in sight is already a violation of 91.175 (c), with or without LPV capability.